When I go on a long flight across the globe (which is rather frequent), I like to be prepared for a comfortable journey. Although I don’t have to fear DVT, it gave me an idea to create this juice that may help others going on a long flight. This juice combo improves blood circulation, so there are no worries for thrombosis or leg cramps due to the cramped space in the aircraft. 2-3 days leading up to the long flight, begin to eliminate foods that cause blood to thicken. Eat as much fresh vegetables as you can, and add this juice into your diet. Highly processed/refined foods, flour and sugar products, meat products, salty foods, alcohol, caffeine, smoking. IMPORTANT: Drink LOTS of water in long flights to stay hydrated. Also read: How to stay healthy when traveling. 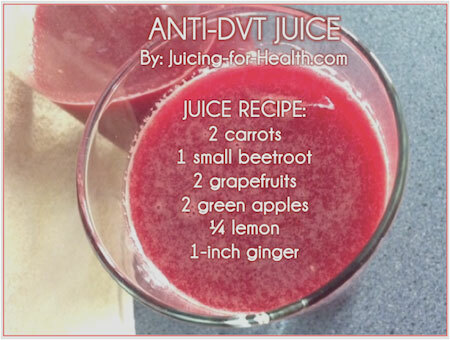 Is there a suitable substitute for the grapefruit in this Anti-DVT juice? Grapefruit reacts with my blood pressure meds and is not recommended to be taken.